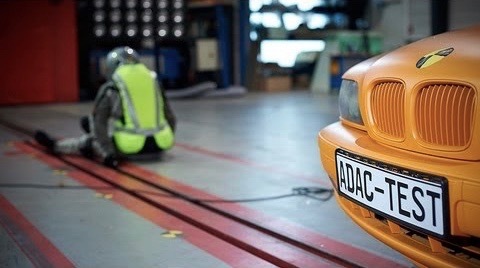 In the event of an accident, the airbag deploys utilizing a 100% mechanical trigger. This results in maximum reliability with no maintenance. Helite uses electronic systems in other industries, but for motorcycle riding use we know that the mechanical trigger is the most reliable and easy to use. 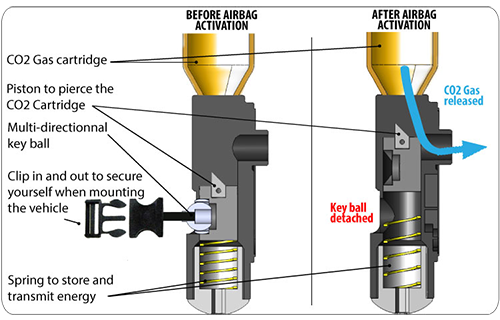 Upon activation, a spring loaded piston pierces the C02 cartridge and rapidly inflates the airbag around the neck and body. The air chambers are designed to stabilize the neck, spine and torso and reduce the force of impacts to vital organs. What is the difference between the Helite Turtle and the Helite Airnest Model? 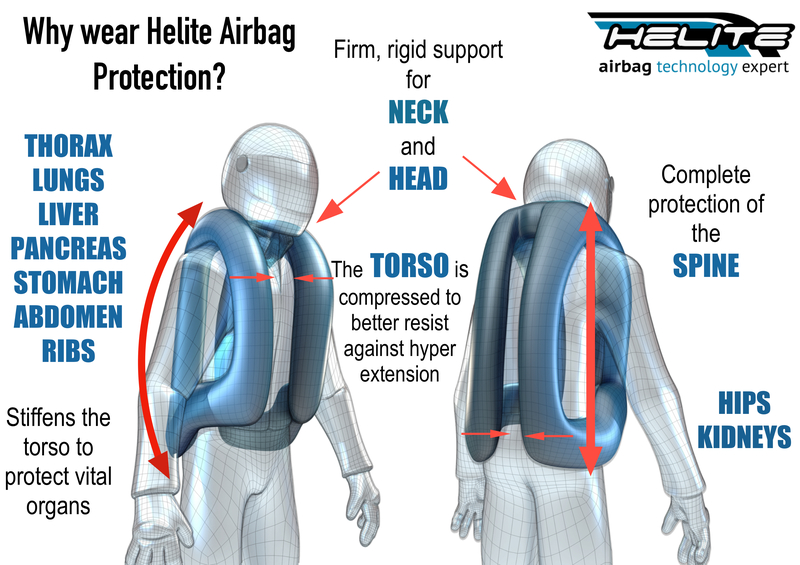 The Turtle is a new airbag innovation from Helite. They added a SAS-TEC back protector that is larger than the previous KNOX protector, but still just as comfortable to wear. 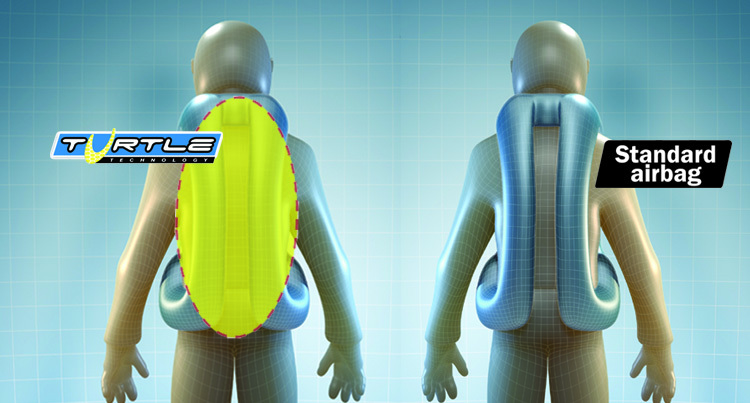 Helite relocated the back protector to on top of the airbag versus underneath like the Airnest system. After deployment the system can be reloaded with a fresh C02 cartridge and be ready to protect the rider again. The Helite system has been tested by independent labs, universities, and certification authorities. 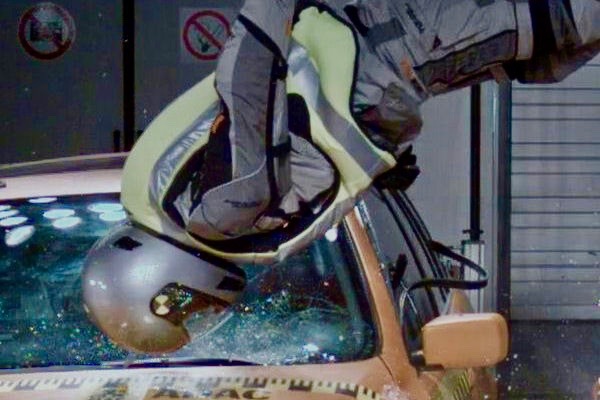 The system has consistently emerged as the best performing personal airbag available. With deployment times under 100ms, Helite protects quicker than any other mechanically triggered airbag.